Don of Gerwn pictured above a black flat-coat. The picture of Don of Gerwn comes from here — The Complete English Shot. He is not a “Liver-coloured” dog as described here, at least as how liver is described in the flat-coated retriever. His nose and eyes are clearly dark, not liver as we mean in the flat-coat. He is juxtaposed with a true black flat-coat here. He is clearly a dark red retriever (“sandy liver”), which makes sense considering he was from Tweedmouth lines. He actually reminds me of Mrs. Charlesworth’s Noranby Diana, an early show champion golden that also placed in a few trials. Black and white pictures are hard to discern, but I think it is clear that his liver color is different from liver flat-coats. His coloration could carry the pale yellow of his grandsire, Lucifer. This would also be true even if he were a true liver. Don was born in the earl 1900’s or late 1890’s, placing in trials 1904. If you look at the reddish tinge that appears in many liver flat-coats and compare the darkest red golden retrievers, you can see how similar the colors are. No wonder things got so confusing at the separation. Incidentally, I like this type of golden. It’s a shame that we’ve decided that the Newfoundlandy type retriever excoriated in Teasdale-Buckell’s book is the only type promoted in conformation. The most interesting thing in this book is how widely the retrievers vary in appearance. The dog called “Devil” is so different from anything I’ve seen in a retriever. He is sandy colored with “whiskers [bearding] like an otterhound.” I don’t know what the hell he was. Could someone have crossed an otterhound with a retriever or an airedale terrier (a descendant of the otterhound) with a retriever? Maybe it’s an early goldendoodle. When you read this book closely, the golden is considered part of the flat-coated breed when the book was written. The curly is deemed ruined for working purposes. 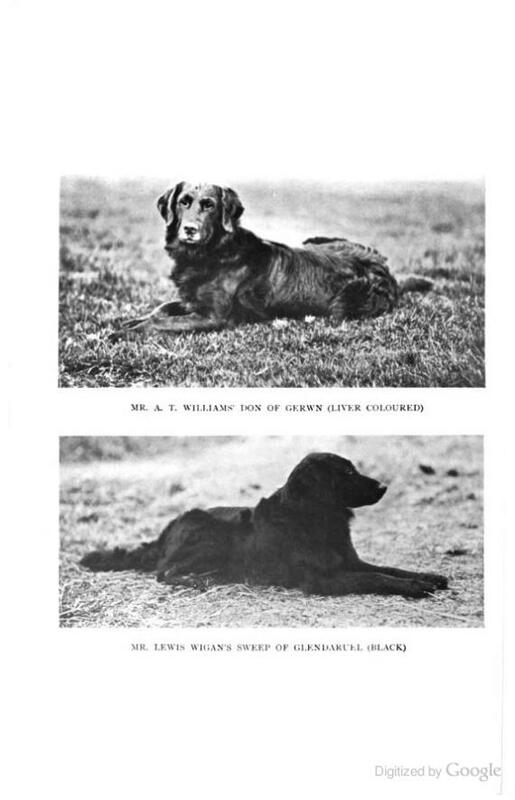 Only the Labrador and the flat-coat (including Tweedmouth’s strain of golden flat-coats) are used for hunting, because flat-coated breeders have done their best to breed out the lumber and cobbiness that plagued the breed in the 1890’s. In the book, he claims that Americans don’t use retrievers, because Americans make their pointers and setters retrieve. Perhaps true in the early twentieht century. He also describes a breed that fascinates me– the Norfolk retriever. It sounds kind of like a Chesapeake bay retriever, only smaller. He points out that Labs and flat-coats (including what became the golden retriever) were interbred. This book is certainly a great historical document. I’m definitely going to purchase it. This is an account in which the Labrador was consider secondary to the flat-coat (including the golden) in working ability. And look at the working conformation! I am trying to research the Norfolk Retriever as I have a Nova Scotia Duck Tolling Retriever & it sounds very like historical references to a Norflok Retriever? Well, I’ve done some research on that. The NSDTR is actually related to a Dutch dog called Kooikerhondje, which looks like a small NSDTR with more white on it and black skin pigmentation. The Norfolk retriever, however, is interesting. I don’t think it is the same thing as the decoy dogs. I think the local breed of curly-coated retriever in Southern Australia is very close to the Norfolk retriever. In fact, it differs in that Murray river dog has a tail, and the Norfolk was docked.